Butch Hartman is a busy busy man. The creator of the hit Nickelodeon shows The Fairly OddParents and Danny Phantom has yet another 2D animation show called T.U.F.F. Puppy, premiering this September on Saturday mornings. 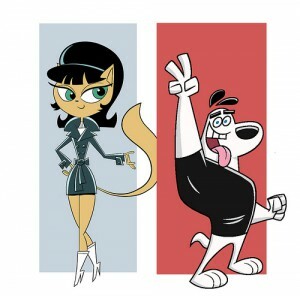 According to Animation Magazine, the show “…follows the adventures of the enthusiastic Dudley Puppy who is recruited to work for the mysterious Turbo Underground Fighting Force (T.U.F.F.) along with the sophisticated Kitty Katswell (think a feline version of Emma Peel! ).” Our heroes find themselves in a constant battle with the master super-villain known as Verminious Snaptrap.